and an opportunity to experience a truly memorable stay in colonial surroundings. You will find most of the comforts of home here and we are always happy to assist you in enjoying this beautiful location to the full. 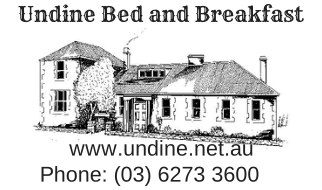 The original grant of the land on which "Undine" is built was made to John Beresford. John had arrived in Tasmania on the 2nd October 1808 as a free settler, John and his wife, Hannah, were on the First Fleet into Port Jackson in 1788. He received the grant of land in 1813 and we know that the land was being worked by the Beresfords in 1817. In 1834 the property became a licensed coaching inn. In the early 1840s the property was known as Rosetta Cottage and the suburb of Rosetta takes its name from it. There was established at this time a Seminary for Young Ladies run by a Mrs. Stevens, the wife of Sylvester Stephen Stanford Stevens. The Goldings converted the property into the Undine Hotel in the late 1880’s or early 1890's and the three storey northern wing was added at this stage. Jilletts, Peacocks, Brocks, Goldings, Watson’s, Hurburghs, Pykes and Clark's. and together with their three daughters look forward to a long and exciting adventure at Undine. The house has loads of history and certainly was built before the young Victoria came to the throne and before Port Arthur was established.